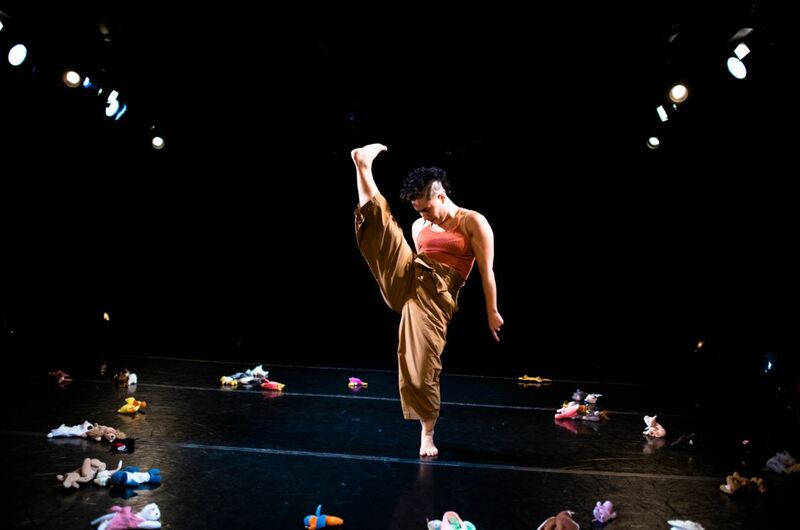 Sarah Chien is an improviser and choreographer in New York City who creates solo works that seek to better understand her identity in a holistic and multi-faceted way. Her upcoming performance, Songs Stuck in My Body, looks at childhood songs, games and artifacts, and how they play into personal narrative. Here, she describes her improvisational performance practice and how she became interested in the topic of childhood. Can you tell me a little about your dance history – what kinds of performance practices and in what contexts have shaped who you are today? Where I am now is far from where I began. I started in ballet like many kids in the Midwest. I grew up in Illinois. From ballet, I got a sampling of what I call classical modern – Graham, Horton. When I got to Barnard College in New York, that opened my dance world. 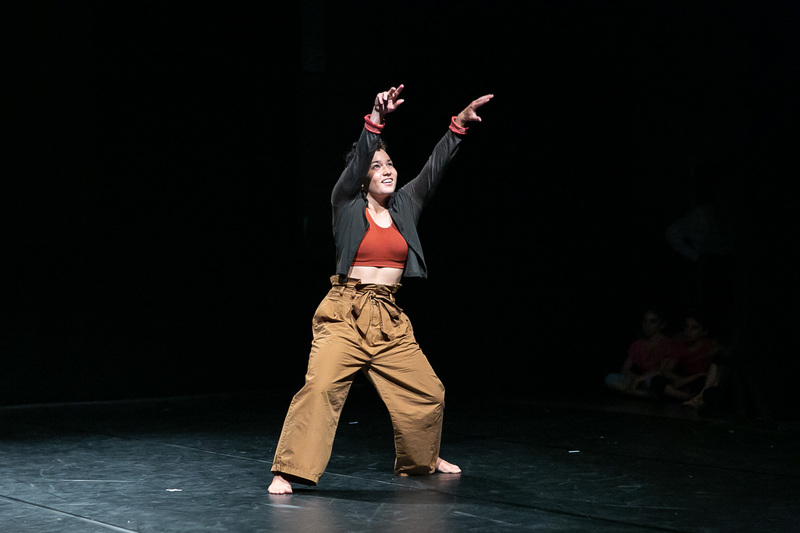 They have a partnership with what used to be Dance Theater Workshop, or what is now New York Live Arts, which exposes students to experimental and contemporary dance. That opened my world more. But where I ended up finding my home is in what’s called Flying-Low and Passing Through. Flying-Low was created by David Zambrano, a Venezuelan artist who is based in Brussels. It’s a floor work technique at high speed. 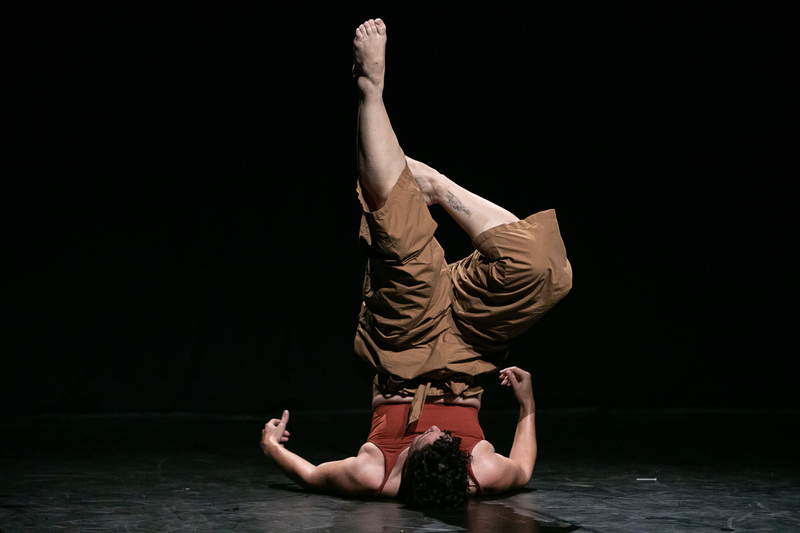 Passing Through is a group improvisation practice which teaches you how to be aware of your body and play in close proximity with other folks while still being able to do your own full movement in and out of floor. These techniques became my love, though they’re very rare in the states. So I found my home in this world of floorwork and improvisation for performance. I’ve also done cross training in aerial, lindy hop, Chinese internal martial arts, and I have a studio practice comprised of mostly improvisation. I worked for a long time after college in small independent dance companies. I’ve danced with Andre Zachery/Renegade Performance Group, Sydnie L. Mosley Dances, Jody Sperling/Time Lapse Dance and in many other projects. I was told we were supposed to do that after school: Find a choreographer you like, take a bunch of dance classes from them, and then ride with them to success. Over time, I would often grow out of a company because I was interested in my own movement generation. I also encountered companies where it felt like the work was more important than the dancers in the work. I finally took a look at myself and said I’m tired of giving my agency away to someone else. I started focusing on solo work. Before, I’d always been making my own work, usually small solos alongside my work dancing in other companies. Once I had stopped begging other people to give me dance opportunities, it turned out I was just fine. The first year that I worked alone, I booked studio space instead of booking classes. I made a bargain with myself that I’d consider it a success if I simply showed up at the studio. I focused on my personal practice, researching my own interests through improvisation. This gave me clarity into how I move and what I’m interested in as a performer. How would you generally describe your work to someone unfamiliar with it? 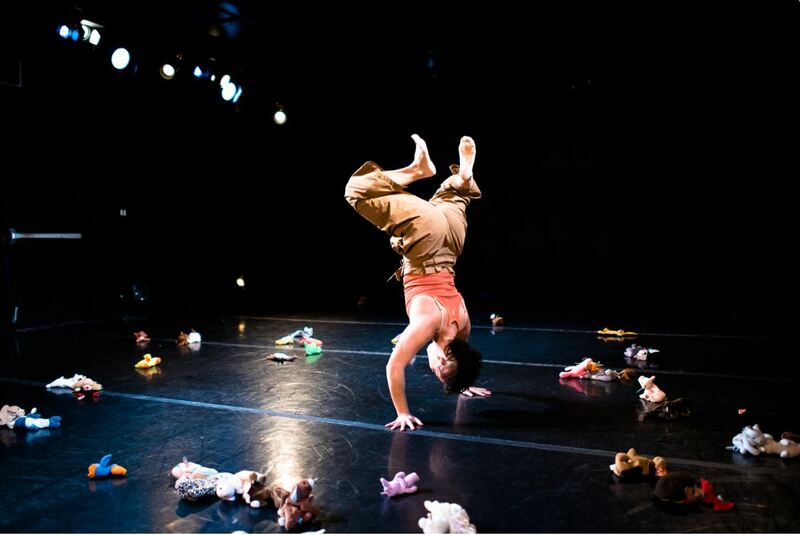 I’m an independent dance artist; my practice is made up of performing, teaching and creating spaces to gather community. I consider all those practices to be artistic work. Each facet feeds the next. If you ask me on a given day about my work, I might tell you about a performance I’m creating, an improvised music and dance evening I’m curating, or the performance parties I run on my roof where I built a wooden dance floor, or the Flying-Low/Passing Through training group I’m running. I like to define myself around all those practices. There’s training as well – I maintain a personal practice. Each of my practices supports each other. In terms of performing, I’m a solo artist. What that means for me is that I try to present myself fully. I don’t dance for others or interpret repertoire. I’ve found that solo work is always collaborative, so I’m not really working alone. I work with musicians, clowns, actors, other improvisers, and this allows for conversations across disciplines. In terms of improvisation, I approach it as a way of revealing more of myself. I research and develop tasks or scores that challenge my own creative physicality. I look for ways to frame the movement in a way that allows for entry points and context for the audience. It’s also important for me to be in partnership with the physical space. I try to be a part of the space as well as transform it energetically. Physicality wise, my work looks very grounded. People often think I do capoeira or breakdance, which I haven’t actually trained in, because they don’t have a reference for movement that’s connected to the ground but not connected to the African diaspora. A lot of my work is movement based, but more recently I’ve expanded my toolbox. I work with text; I tell stories on stage; I work with voice and breath a lot too. The training I have from David is about using every part of the body to express the whole self. That can include facial expressions or gesture as well. Can you tell me about your upcoming performance, Songs Stuck in My Body, and how the piece came about? I had a little improv spot in a mixed bill showcase called the Creators Collective in November 2017. At the time, my parents were moving, and my mom kept calling about old stuff in the basement. I asked her to send me my old Brownie vest and a Junior Girl Scout sash. I went into the studio with those two items, and I had this idea about children’s songs. I created a series of scenes and performed it in the showcase and the audience laughed, which had never happened to me before as a performer. I loved it. Laughter is a good indicator that the audience is with you. 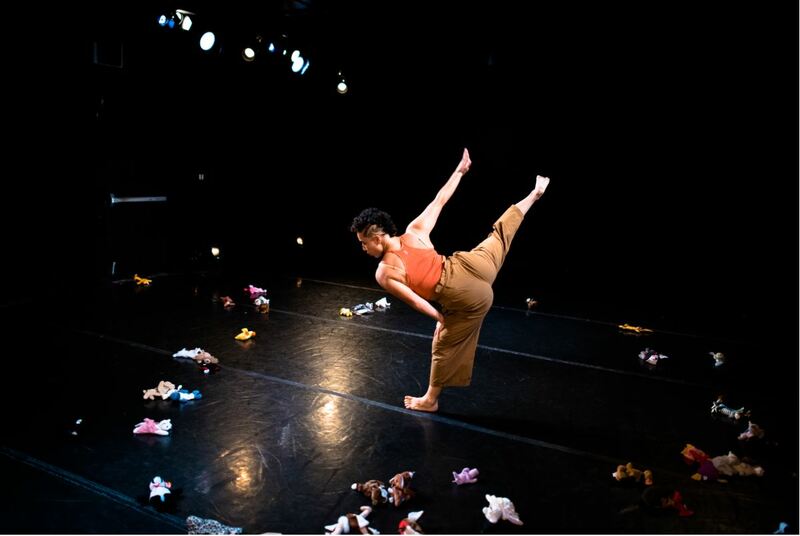 Songs Stuck in My Body is a piece about making sense of the disparate pieces of identity from childhood. There are two key experiences that were the catalysts for this topic. Studying with David Zambrano, he often encourages dancers to use folk material. Many of his students come from small countries in Europe and Latin America, and he’d ask them to share folk songs or dances. I’m usually the only American, and I was always nervous about what I would do if he called on me. I asked myself: What can I share from my country? In preparation for these workshops, I started to research what American things I knew well, and I came upon kids’ songs I knew from my childhood. Then, in 2017, I went to a Shabbat dinner in Manhattan. I was raised half-Jewish, and practice Reform Judaism, but this was a Modern Orthodox dinner – outside my comfort zone. At the end of those dinners there is a round of traditional songs sung in Hebrew and Yiddish. I started to zone out until an older woman switched into singing folk songs in English. I was so surprised to suddenly hear melodies and words I knew! My mom, who is from the New York area, had taught those same songs to me. I realized these were part of a lineage. They actually come from somewhere. There’s a book called Rise Up Singing that’s a song anthology, and I found out people meet up and sing these songs. I ended up going to one of these at the Ethical Cultural Society. People meet every week and sing folk songs. I was interested to find out I was connected to something I didn’t know had meaning. I started digging into songs we carry with us. I don’t have a great relationship with my family, so it was strange to find myself in a place of nostalgia about these childhood things. I was wrestling with the transformation and artifacts of memory, looking for a way to sort through and weave this stuff together, and that’s what the piece ended up being about. What do we do with memories that no longer fit? It built iteratively over a series of performance opportunities. Because I build improvisations for performances, I’m better at generating ideas through performance. The 10-minute improvisation in November 2017 started with song and clear gestures: “There’s something in my pocket, it belongs across my face; I keep it very close at hand…” I started from there. The second song was “Head, Shoulders, Knees and Toes,” which became a simple improvisation score where I discover unique movements with the body parts in the lyrics. As the piece started to develop over a series of performance opportunities, I’d often pair physical tasks with a song, artifact or prop. Sometimes I juxtaposed them. Sometimes the connections were clear, sometimes trial and error. I tried to layer on memories and physical tasks. Each prop – from Beanie Babies to a red radio flyer wagon and the Girl Scout clothes – created a new scene. The first 10-minute sketch I did by myself. The next opportunity was at Triskelion, and for that I needed to bring in collaborators. I had my aunt, who is a theatrical clown, consult on a few rehearsals, and I brought in my friend, Lauren Hlubny, who is a theater director. She works in devised theater, which shares improvisation’s task-based approach. Lauren is the kind of director who appreciates what the individual performer brings and can highlight that. She started as an acting coach, helping me learn how to prepare my monologues for the stage and teaching me breathing techniques to support the vocal elements. Lauren and I worked so well, she became the director of the piece. She helped me clarify what I was saying and crafted the arc of the piece. She’s become an indispensable part of the process, especially when I’d find myself in a creative rut over the course of this year-long process. We’ve started working as equal collaborators in the studio; it’s my story and movement, but Lauren helps me come up with exercises, tasks and props. She’s also been a huge believer in me and the piece, pushing me to look for opportunities to produce and tour it. It’s really incredible to have an advocate and a partner when you’re doing something so personal. In that way, solo work never ends up being solo work. What do you hope audiences take away from Songs Stuck in My Body? The message is that each of us is already in possession of the raw materials to tell our stories. It’s about making something from the insignificant, confusing or weird things that make no sense. It’s about examining what you have and weaving it back into the story you tell yourself about yourself. I’ve always loved personal narrative – podcasts, comedy, essays, live storytelling – but thought that I didn’t personally have anything worth telling. Now I’m sure that’s not the case. I hope other people can find that same message. Looking at your larger body of work, are there certain themes or issues that feel important to you to keep tackling or addressing? I’m always exploring different modes of making work. I do a lot of self-producing in different spaces as well as solo work or working collaboratively or in collectives. It’s important to me to make work outside the company hierarchy. I hope to inspire others to make solos, instead of being paint or clay for someone else’s art. I want to see others find their own story and movement vocabulary. I ask of myself: How can I create the conditions in this performance to really be fully me? The personal is political, so each of my identities are in my work – mixed race, queer, feminist – but I don’t take on a single issue as the defining mantle. I also think about how to let people in and take them with me throughout a piece. It’s important that my work is relatable, that people can have a way in and engage with it. I want audiences to access it without an arts degree or any specific familiarity with dance. To learn more about Sarah, visit www.sarahchien.com. Lauren Hlubny is the NYC artistic director of Danse Theatre Surreality. In addition to being a gifted, dancer and performer, Sarah is a great writer. Smart, beautiful and lovely. My niece continues to delight and amaze me and the world. Im really glad to have Read this. It really “fed” me Creatively and even Spiritually speaking.